it's better to swing a blade than an empty gun. Most gun owners own, use and enjoy some pretty nice knives. using a kitchen knife against an intruder. But have you ever thought about (or studied) knife techniques and strategies? Sure, you can open a box or slice a steak, but self defense? There's more to it than wildly waving a wicked blade. 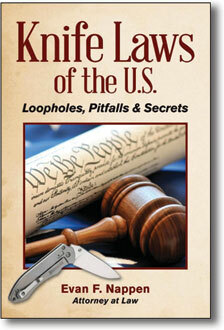 Knife Laws of the U.S.
A comprehensive guide to federal and state knife laws for your state and traveling! 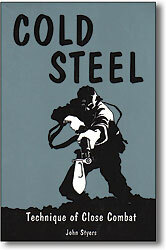 Covers every type of bladed weapon, the loopholes, pitfalls and secrets in easy to understand language. Don’t take chances, and it’s fascinating stuff! Long overlooked, knives are important arms too. Nappen is a top national expert attorney. A Marine fighting man’s approach to close quarters combat, with edged weapons from bayonets to all sorts of knives, clubs and even bare-handed conflict. 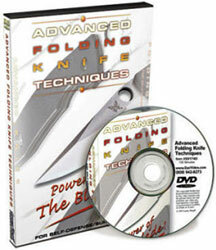 Loaded with step-by-step photos, blends martial art, anatomy, strategy and various non-gun tools for self defense. 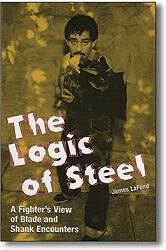 Analyzes more than 250 knife fights, from the perspective of attackers, witnesses and victims. 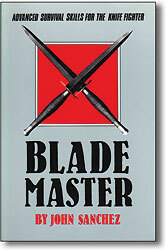 Offers deep insight into blade and shank encounters, detailing the methods and psychology of attacks, injury patterns and legal ramifications. Provides tips on what happened and why. A real-life training manual for advanced students, touches on techniques of knife fighters from around the world. Covers target training, strike patterns, striking methods, knife shifting and more with helpful diagrams. Special section on deviant styles. $34.95 list, our price only $19.95! They're small, lightweight, very popular and... extremely dangerous even if they seem innocent! The ultra-popular "little knife" with a 2- to 3-inch blade can spell big trouble. This video displays and demonstrates the most popular little knives now available and shows what they can do when used viscously and violently against an aggressor. You'll see Benchmade, Spyderco, Cold Steel, and even Leatherman and Gerber multi-tools like you have never seen them before. You'll have a new-found respect for those little knives after you see what they do to the star of this show..."Meat Man." If you typically carry a small blade, see what that little puppy is capable of doing. A graphic look at the awesome power of a 4-inch folder when placed in the hands of a moderately trained individual. You'll see an incredible cutting demonstration with the star of the show, "Meat Man." Plus, examine basic and advanced knife fighting skills, a realistic approach to what happens in a knife fight, what to look for and what to do when a knife is presented towards you, what type of knife is most recommended for self-defense, and why. Incredible and beautiful cutting demonstrations, and why some modern knife fighting experts do not truly understand the power of this blade. This is a great reference, because it wakes you up to the reality that there are a lot of people who carry these knives and don't know what this blade can really do.